My favorite look for Spring is the "wavy" look. Curls are kind of boring now and straight hair was never really my thing. I still haven't been able to tease my hair correctly to get those effortless looking waves that so many models and celebs have. Sigh, maybe one day. But while I'm still trying to get the perfect "Wavy hair look", Nexxus has came out with an amazing line of haircare. 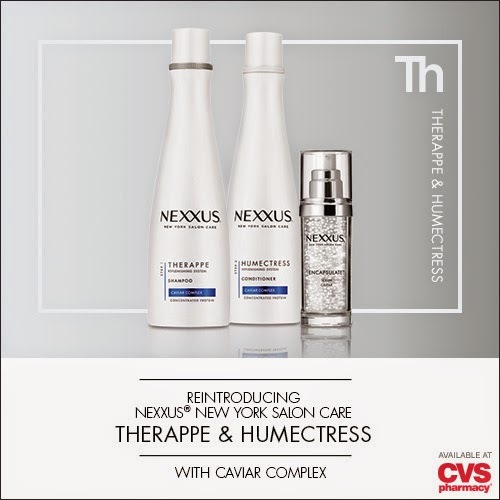 Treat yourself to Caviar Nexxus Therappe Shampoo and Humectress Conditioner available at your local CVS. This fabulous duo comes in a few different "system" sets, which means they cater to all hair types. My hair is dry and damaged from lots of coloring and heat products. If you really want to pamper your hair this Summer, it's affordable and right around the corner from you. 10 years ago you could only get such a great duo at a salon. I'm really excited this brand is at CVS; I've actually been using Caviar Hair Care for a few months now and the results are impressive. The product is 100% Elastin protein and Caviar Complex, helping you rebalance, restore, and replenish my hair so it is soft, nourished, and manageable. My hair feels fresh soft and easier to manage. 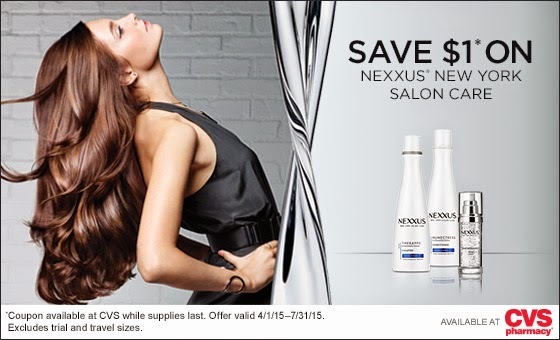 From 3/29-4/26 you can print out this coupon for $1 off any full sized product from Nexxus Hair Care. CVS also will have Beauty Consultants on stand-by, waiting to help you pick the right hair care products for your specific hair type. I've already printed out MY coupon, and I can't wait to visit CVS and stock up! Click here to find a CVS near you. Also, I just wanted to say thank you so much for your readership and consistently leaving kind comments! I really appreciate you!